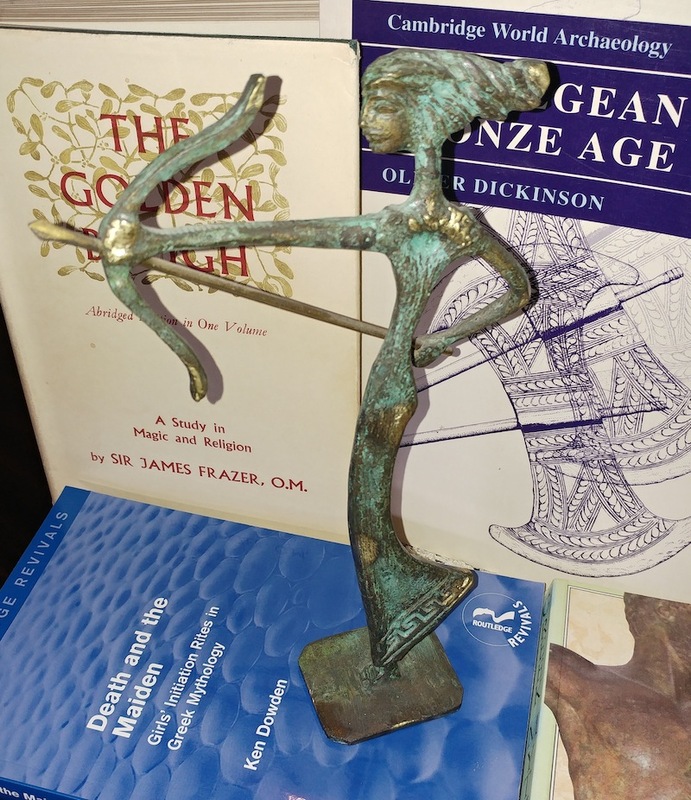 I have a copper figurine that I bought nineteen years ago in Athens. I paid more for it than I realised at the time, but it’s worth far more to me than I paid. While it does have a certain sentimental value – as a souvenir of my Greek adventure – its true value is in who it represents. Artemis is my goddess. Not that I believe in her as a divinity, but as an idea, as a character in an ancient story, she resonates with me. The wild huntress, untameable and untouchable. She appears in both my novels. She is the goddess most closely associated with Iphigenia, who I love. How strange that we can feel such passion for ideas! Was there ever a woman called Artemis? Or a girl called Iphigenia? My figurine, that I treat with less reverence than perhaps I should, is a representation of my goddess. By the laws of sympathetic magic, to treat the figurine with respect is to treat the goddess with respect. Is this not why religious icons have such power over us? Because icons give us power, of sorts, over the divine? What then of a life-size, life-like figurine of a beautiful woman? If Woman is divine, does possession of such a figurine give power over Women? If we profane the sacred icon, will we face divine retribution? It’s not real, and yet… And yet, ideas have power. Respect the figurine and you respect all women. Disrespect the figurine and you disrespect all women. It means something. The figurine may be an inanimate object, unfeeling and uncaring, but it represents something important. A sexbot can never be “just a machine”. It is made in the image of man, or woman, and should be treated with the same respect. It’s not what you do that matters, so much as why you do it, and how. This entry was posted in Idle Chit-Chat and tagged artemis, divinity, goddess, Greek mythology, iphigenia, sexbot, sympathetic magic. Bookmark the permalink. Artemis is a favorite of mine too. She’s also a protector of women. I feel like Hunger Games’ Katniss is based on her. There are indeed many parallels between Katniss and Artemis, not least that both are archers and hunters.